When the Social Security Administration released its annual list of most popular baby names for 2012, one new name made headlines: Khaleesi, the term for “queen” in a fictional language from the Game of Thrones series. But when we started scanning Social Security’s official baby name database, we found something even more fascinating: 336 babies were named Kale (11 girls and 325 boys). Looks like kale has been America’s darling for longer than we originally thought—the name was first used in 1962. And while we were not surprised to learn that the highest concentration of little Kales can currently be found in California (#agriculture), we were intrigued to learn that the first baby Kale was born in Kansas. It’s been gaining popularity since 2005—quite possibly due to the leafy green’s parallel rise to prominence. Can Watercress and Mizuna be far behind? At midcentury, Americans were apparently more into vegetable names than fruit ones: Apple didn’t first surface until 2005—in California and Texas—a year after the birth of Apple Martin, Gwyneth Paltrow‘s daughter with Chris Martin. Five Apples were born in New York in 2010, but beyond that, it hasn’t budged from California and Texas. Now, apples have been a part of our cultural cuisine for centuries—the first American settlers brought grafted trees (a must for any discerning traveler) from Europe. 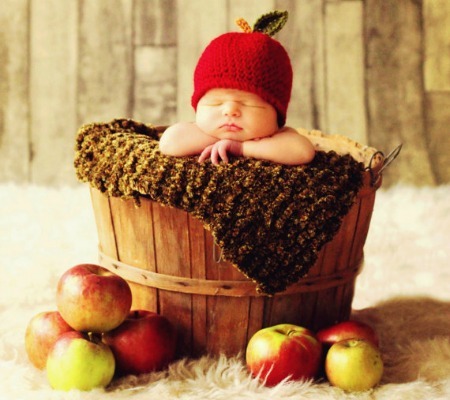 But what’s curious is that the country’s top apple producing state—Washington—isn’t home to a single baby Apple. We were sure that Georgia would hold the title on Peaches, but since its first use in 1975, the name has been most popular in California and New York. A little digging reveals an intriguing clue: Not only has the Peach State fallen behind South Carolina and California in actual peach production, but its most bountiful crop is actually blueberries. The name Olive’s been hanging around since the early 20th century. Its highest concentration in 1910 was in Vermont and New Hampshire, and it gained traction throughout the country all through the ’20s. It all but vanished from use in the 1950s—which is curious, because American olive consumption was reaching a fever pitch during that decade (think: dirty martinis and tapas-style appetizers). But just like “classic” cocktails, Olive made a comeback in the 21st century. In 2012, a whopping 125 baby Olives were born in California, where olive production has soared since the early 2000s. This one’s not technically a food, but it’s close enough for our lenient editorial philosophy to include it here: Coco first appeared as a name in Texas in 1995, with five girls bearing it. It jumped from California (in ’97) to New York (’98), and volleyed back and forth until 2005 and 2006, when it spread as far as Florida and Washington. In 2012 its highest concentration was in California and Nevada. We’ve been sipping on hot cocoa for, well, just about forever, so why the recent popularity? We’d like to think it’s because of Ice-T‘s wife, Coco, but that’s crazy. Clearly—obviously—it’s because of the coconut water fever that’s been sweeping the country over the past decade. America went Tea-crazy in 1996 and throughout the early 2000s—there was a high concentration in the Midwest, especially, in 1998—but by 2012, it had caught on with the coasts, too: That year, California was home to nine little girls named Tea, and New York and New Jersey laid claim to five each. Americans have been drinking tea since long before the name became popular—hello, Boston Tea Party—but its prominence is pretty neatly aligned with our interest in loose-leaf, high-end teas—the popular chain Teavana opened in 1997. Fewer folks preferred their babies’ tea-related names to be of the specific variety: Chai was first used as a girl’s name in 1989 and as a boy’s name in 1984 (both in California), but each year produced fewer than 10 little Chais. It’s possible the name’s popularity has something to do with the introduction of Starbucks’s chai tea drinks, but based on that logic we should be seeing a lot of little Pumpkin Spices running around, so we’re still investigating this one. Even though the name’s Irish origin means “foal” (and in English alludes to the French chérie), we can’t help but call the drink to mind. Folks in New York made it baby-specific as early as 1918, and the name popped up in the state for the next few years. It wasn’t until 1925 that it caught on in California; a year later the same thing happened in Texas. By the mid-’30s the name had spread between the coasts, and by 1945 the country had gone crazy for Sherry. It surged on strong until the late ’70s and then began steadily petering out. Fun fact: Sherry exports from Spain “rose dramatically” from 1944 to 1979, before their tragic drop. This name first appeared in California in 1925 with the birth of five little Gingers (no word on whether they were redheaded), and the timing dovetails nicely with the Prohibition-era boom of ginger ale—a popular mixer at the time, because it effectively masked the strong flavors of bootlegged alcohol. As a name, Ginger peaked in the late ’60s and early ’70s, with the highest concentration in Texas: There, every year from 1946 through 1983, more than 50 new Gingers were born. It’s definitely worth mentioning that Gilligan’s Island aired from 1964 to ’67; in that show, Tina Louise portrayed the sultry actress Ginger. In keeping with the spice theme, Pepper came onto the baby name scene like gangbusters in 1975, making appearances in Florida, Kentucky, Tennessee, Michigan, and Ohio, to name a few. The name fell out of favor quickly, though, with a few sporadic appearances from 1978 to 2010, when it began regaining popularity. What we’re left wondering, though, is what influenced these creative parents: Peppercorns? Capsicum annuum, or chiles? The Red Hot Chili Peppers? Although people have been eating fermented soybean product for centuries, Tamari as a baby name didn’t appear in the U.S. until 2006—with five female Tamaris. Science may be on the fence about soy’s health benefits, but sushi (and all of its accoutrements, like wasabi and soy sauce) have been taking the nation by storm in the last few decades. Miso, however—from which tamari is traditionally made—is missing from the SSA database. The name Honey existed almost exclusively in New York until the early 1960s, with its first appearance in 1917. Honeybees have been farmed in North America since 1622, but production boomed in the 1920s, moving from small homestead operations to large colonies and packing plants—so the timing of this darling name’s popularity seems spot-on. By the ’80s the tides had turned, and people named Honey appeared most frequently in California and Texas. Americans sure were keen on their natural sweeteners in 1917: As with Honey, this was the first year Maple was used as a name (curiously in Oklahoma, a state that, while containing maple trees, doesn’t register on the USDA’s list of top 10 syrup-producing states). Throughout the ’20s, ’30s, and ’40s, use of the name was heavily concentrated in the Southeastern states of Mississippi, Alabama, Louisiana, and Arkansas—again, states that didn’t crack the USDA’s top 10. Given the popularity of bread and whiskey made from rye (even George Washington distilled the spirit), it’s surprising that it didn’t catch on as a baby name earlier. But until recently, when we talked about rye, all we talked about were edibles. Is it a coincidence that, in 2010, with the resurgence of artisan loaves and boutique rye distillers came a handful of children named after the grain? Only the Oregon parents of the 5 little boys named “Rye” can answer that question. So what’s the takeaway? It appears that while California, New York, and Texas are the most food-forward states when it comes to naming babies, we’re all hopelessly susceptible to food trends. We’ll wait with bated breath for the birth of America’s first precious baby Sriracha.